Living in Singapore: Oman: What kind of name is 'Phet'? Oman: What kind of name is 'Phet'? A weekend trip with friends to Jabal Shams has been cancelled due to a spot of weather. 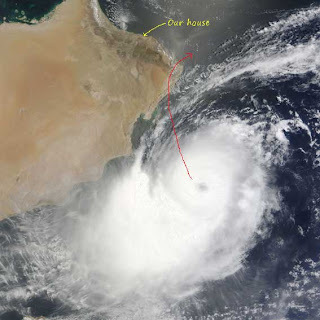 Looking rather similar to Gonu three years ago, cyclone ‘Phet’ is working its way northwest towards the tip of Oman where it is predicted to turn right and head towards Pakistan. Once again, Ras Al Hadd looks like it will take the full brunt of the storm. Looking outside this morning, there doesn’t seem to be the same sense of impending doom in Muscat as there was with Gonu, but there’s bound to be plenty of rain. Stay away from Carrefour unless you want to be caught in a panic-buying stampede of frozen hotdogs, instant noodles and powdered milk. It is a thai word, meaning diamond, that is pronounced like the English 'pet'. Cute name for a hurricane no? Thanks OP - sounds a bit better than the way I was pronouncing it like 'Fet'.